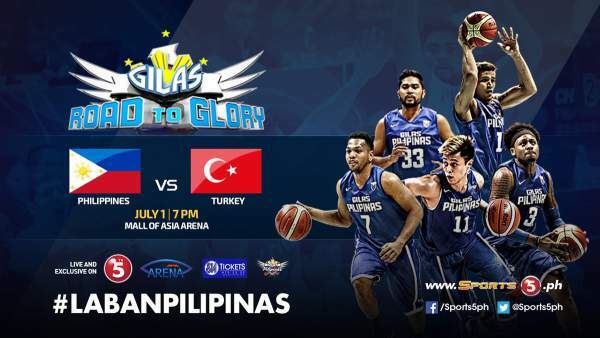 Tune-up Game: Gilas Pilipinas vs. Turkey Result and Full Video - Balita Boss! Gilas Pilipinas, the Philippines men's national basketball team, will play Turkey in a tune-up game as part of their preparation for the Fiba Olympic Qualifying Tournament. This is the second of two tune-up games with Turkish National Basketball Team. Tickets are available at SM Ticket Outlets or online at smtickets.com. In their first tune-up game in Istanbul, Gilas Pilipinas suffered a 35-point beatdown by Turkey. Baris Hersek led Turkey with 16 points, shooting 7 of 8 from the field. Former NBA player Semih Erden had 16 points and 4 rebounds and Samet Geyik chipped in 13 points. Naturalized Filipino Andray Blatche led Gilas with 23 points, while Jayson Castro added 15 points. Calvin Abueva scored 8 points, LA Tenorio had 6, while Ray Parks and Jeff Chan added 5 apiece. Continue reading the full story on TV5.com.ph - Reality check: Turkey blasts listless Gilas by 35 in tune-up match.